When a friend called to tell me about a new movie she saw called BFG, I knew immediately I had to read the children’s book BFG by Roald Dahl. I had given up on Dahl’s books because some of them were a bit too dark humor for me, but hearing that the movie was a delight meant that the book would be even better. And I was not disappointed. 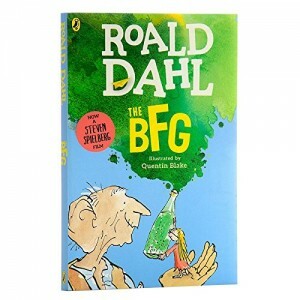 If you are in need of a cheerful happy ending story, as a children’s book BFG is perfect. The edition I read had delightful illustrations, and the plot itself can appeal to just about everyone. I can easily see this being a read-aloud children’s book, but not for younger children. As always, the British humor can be a bit strong for younger children, with giants eating up children left and right. I would put it at about 8 to 10 age group. I especially enjoyed the resolution. I loved the way Dahl portrays the Queen, and her down-to-earth approach to something as incredible as man-eating giants. The humor is dry but continuous throughout this children’s book. An interesting pedagogical aspect would be to work with the abysmal language of the giant, and have children work out the correct sentences, teaching grammar in a fun way. Just take the quote above. Each sentence of the giant can be a wonderful language arts lesson. All in all, a fun children’s book. I’m sure the Disney movie is fine, but…why bother when you can enjoy this lovely book?